Shawn Mendes is a Canadian singer and songwriter who rose to fame in 2013 after posting videos to Vine. Born in 1998 in Toronto, Mendes has quickly risen to fame and supported Taylor Swift on the North American leg of her sold-out The 1989 World Tour. His debut studio album, ‘Handwritten’, reached number one in Canada and the USA when it was released in April 2015, reaching number 12 in the UK Official Album Chart. In 2014 and 2015, Mendes was listed as one of Time’s 25 Most Influential Teens and was included in Forbes’ 30 Under 30 list for 2016. In January 2016, Mendes knocked Justin Bieber’s ‘Love Yourself’ off the top spot in the UK charts with his single, ‘Stitches’. 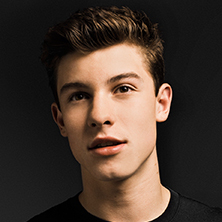 Eventim is the place to look for Shawn Mendes tickets and tour dates. To be the first to hear when more Shawn Mendes tickets go on sale you can sign up to the Eventim Ticket Alarm below.